Instant Music Therapy. No prescription needed! Players love feeling the vibrations through the wood. Supplied with gig bag, tuning lever and full instructions. Designed and invented in the USA in collaboration with Australian music thanatologist Peter Roberts, the Reverie Harp is fast becoming a must-have tool for music therapists, visitation ministers/chaplains, activity directors, and nursing homes care-givers. In an effort to make Reverie Harps accessible to more people, we are pleased to offer a more economical model. 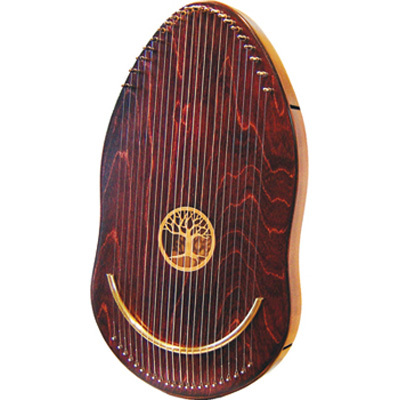 The tuning is the same as the original model, but the soundboard is made of laminated birch instead of solid mahogany, the strings are attached differently at the bottom, and the entire instrument has a red mahogany stain. You will also notice a slightly different shape.